These easy Thanksgiving centerpiece ideas come together last minute and use things you probably already have to create the perfect festive table. 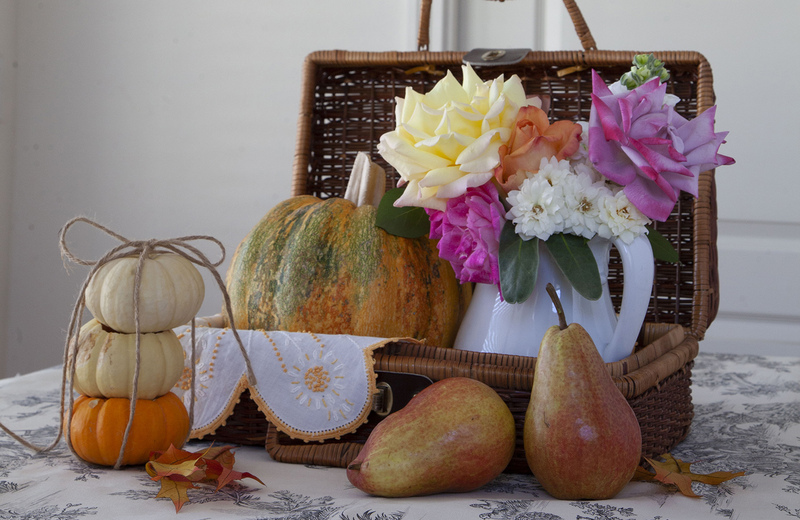 Thanksgiving centerpiece ideas should be easy and impressive. That’s exactly what this vintage-inspired look elicits. Dazzle your guests with towers of Fall nature as your centerpiece. Using pumpkins of varying colors, shapes, and sizes create a visually interesting display, while pockets of fresh flowers and greenery make a pleasant contrast. 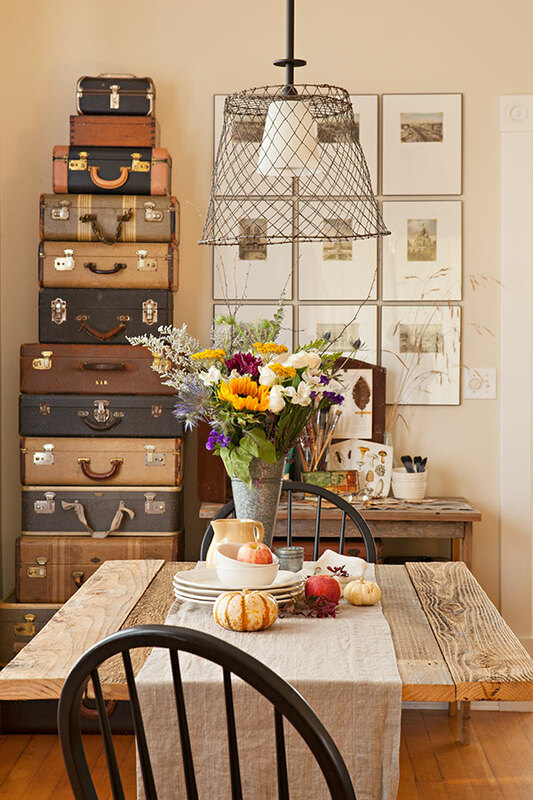 Thanks to this clever arrangement, the table feels full and alive, the centerpiece resting on a rustic burlap runner and accented with simple ceramic plates. 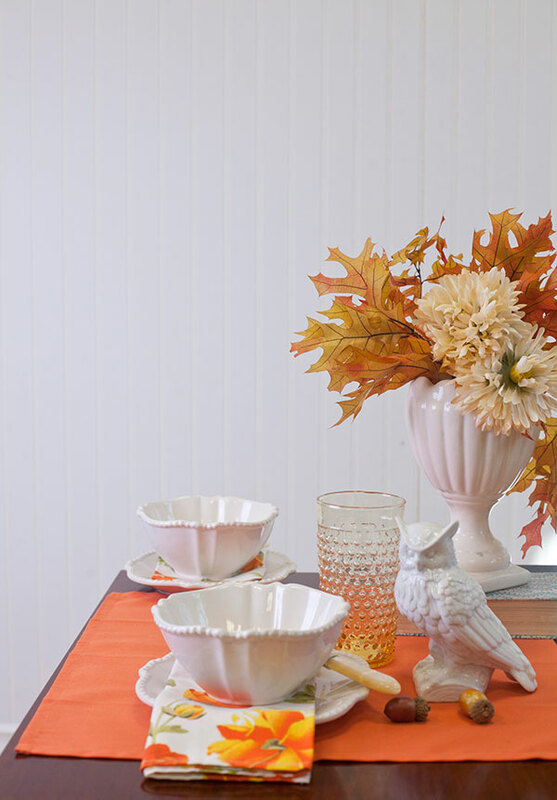 The addition of Carnival glass cups and bowls adds nostalgic flair, while keeping with the fun Fall theme. Don’t be afraid to try a more vintage choice for your table, using items like the large bronze urn pictured to hold and stack your centerpiece elements. Personalize this centerpiece by changing up what is stacked. Rather than just pumpkins, experiment with other Fall favorite harvest items like maize or apples. Spend some time practicing what elements work together with faux flowers and décor from craft stores, before you decide to buy fresh! 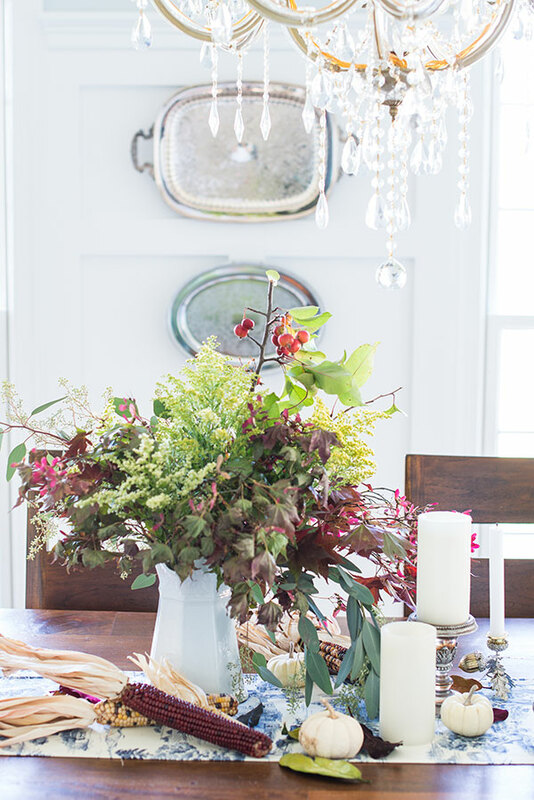 This floral centerpiece stands as the focal point to this rather simple table. The simplicity of this dining room leaves a lot to the imagination. The rustic vibes from the natural wooden boards of the table and the warm color scheme of its surrounding décor can be used to your advantage, highlighting color choices from your centerpiece as it stands against a neutral background. 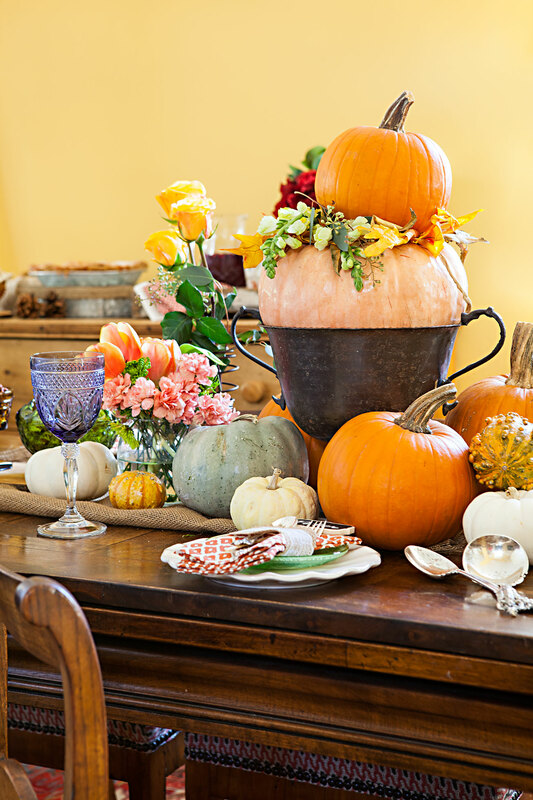 With an uncomplicated linen runner and small elements of Fall bounty, like mini pumpkins and apples, the pop of color from the floral centerpiece elevates this once barren table to one with plenty of playful Fall character. Customize this look with some personal touches, like well-loved dishware and silverware or your own favorite, seasonal flowers. Don’t be afraid to try something different for your centerpiece, like your own handcrafted floral arrangement! Ask your local florist what appropriate flora is in season, and get some tips if you’re new to flower arrangements. Centerpieces can be more complex than just a bouquet of flowers. 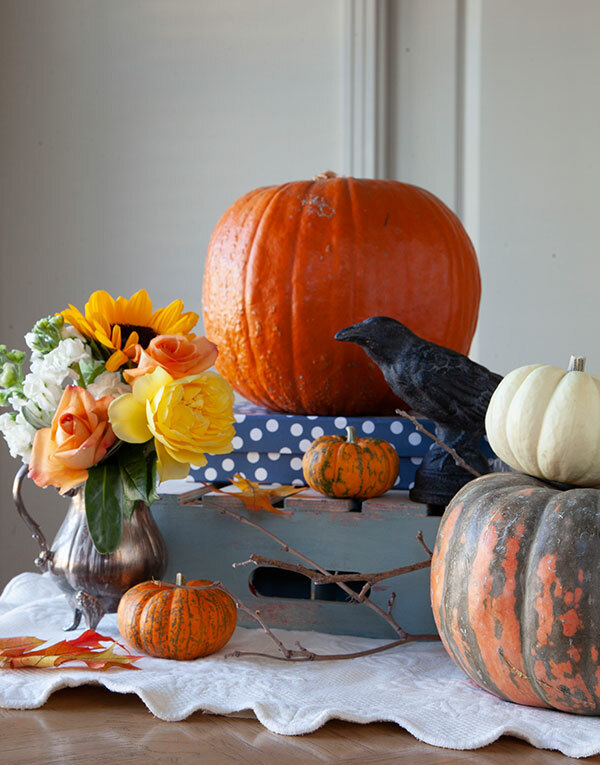 This table has a more fun, Fall vibe with its tiny floral display, crow companion, and pumpkin additions. Stacked on top of blue vintage boxes, pumpkins sit large and in charge, showcasing that everyone’s Fall favorite gourd has arrived. Be sure not to overcrowd your guests by picking a pumpkin too big; pumpkins that are mini to small are perfect for the table! Since the elements range in height, the eye is naturally drawn to the contrast and complementary colors. Flowers once again make an appearance, this time in a brass urn and are the perfect shades of yellow to orange, matching its Fall harvest counterparts. Personalize Thanksgiving centerpiece ideas by painting your pumpkins. Don’t have blue boxes? Consider painting a pumpkin a similar shade of blue, as it is the contrasting color to orange. Adding designs like polka dots or chevrons are sure to give some dimension and character to your centerpieces. Fall colors are well-known to most seasonal decorators. The traditional reds, orange, and yellows are commonplace for most options when looking for something to add to your décor. However, consider this table’s floral centerpiece and notice how these common Fall colors are just the accents to beautiful brass, gold, and copper tones. Dotted with metallic thread, this table’s placemats bring a pop of glitz, while subtle glass gold-rimmed cups rest alongside guests’ brassy, leaf-shaped plates. This table gives off an overall more mature, sultry vibe, the dark wood of the table taken into account when choosing centerpiece elements and colors. Wooden accents are also present on the table, adding a softer, warm color to darker hues. Simplicity is key when it comes to bold elements like metal, a pop of color against the darker feel of this table’s arrangement creating a sophisticated display. Customize your centerpiece to work with metal elements, using only a few colors like this table’s singular yellow and orange flora. A perfectly quaint cottage style arrangement, this table’s centerpiece thrives thanks to its darling woven picnic basket that holds its elements together. Once again, Fall bounty are present, this time with the addition of pears! This sweet fruit has a unique shape that adds a new twist on what element to add to your own centerpiece. Patterned tablecloth below adds a complexity without crowding the centerpiece, while also keeping the table clean. The precious white and orange doily peeking out under a green smattered pumpkin and twine bound mini pumpkins arranged from lightest to darkest, are equal parts playful and adorable. The addition of flora isn’t far behind, though the colors aren’t the usual reds and orange, opting for a fresh pop of fuchsia and cream all styled in a pale blue ceramic pitcher. 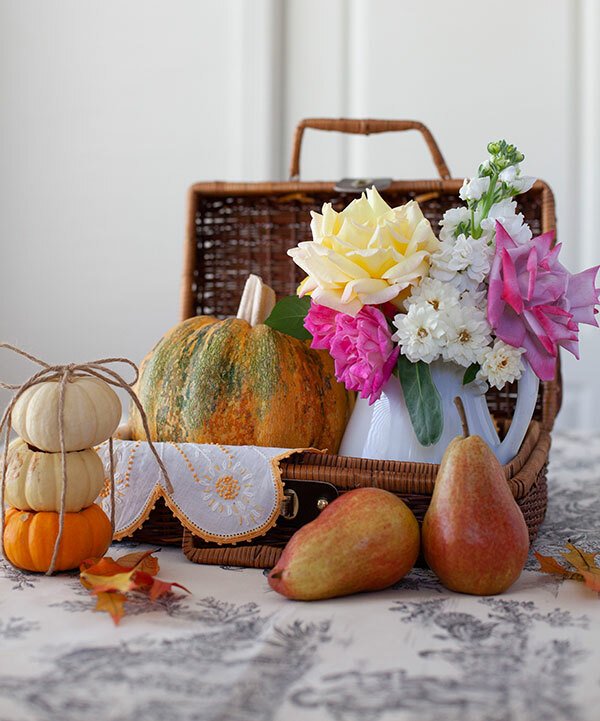 Personalize this centerpiece by adding your own handmade crafts, like doilies or crocheted granny squares. Get the kids involved and add fun family elements of paper crafts or pumpkin painting! Rather than using the typical Fall color scheme, this table opts for a clean, green and burgundy combination. The centerpiece holds no flowers, but overflowing bunches of greenery like Baby’s Breath and Ivy, with splashes of deep red. The harvestables that line the table include red and calico maize as well as mini white pumpkins, placed along a blue and white table runner that mimics classic transferware. The candlesticks that rest next to the centerpiece mirror the elements of the silver trays that hang on the adjacent wall, creating a cohesive design that is carried throughout the dining room. Customize this centerpiece idea by reading up on different arrangements, and tweak what greenery you want to display. Don’t feel boxed in by traditional Fall colors, and feel free to experiment with what your existing décor has to offer. Take the centerpiece from this table as an example of a reusable design, one that can be subtly tweaked throughout the season to match any corresponding holiday décor. Simplicity is often the best option if you don’t know where to start when it comes to any decor decision. Using an appropriate color palette and a few pieces you enjoy will reduce stress when arranging your centerpiece, and guests will be sure to notice your extra care. 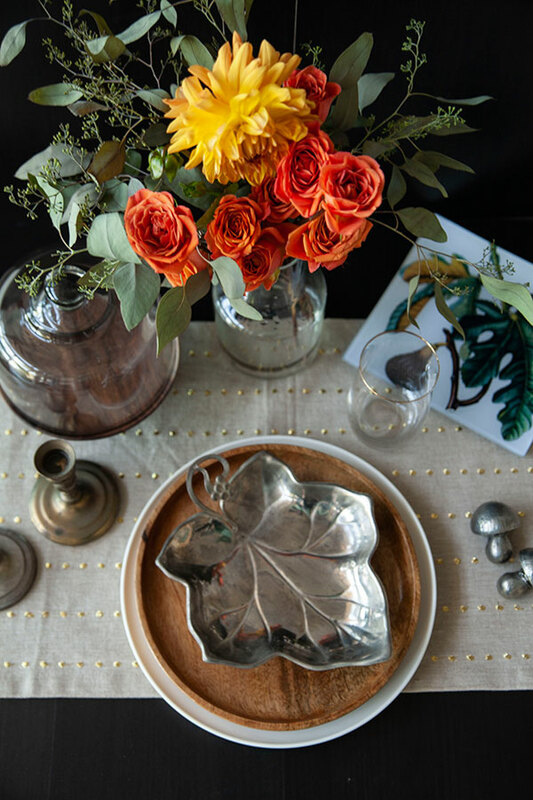 This table broke down the elements of Fall, from the fallen leaf floral arrangement to the ceramic owl watching over your guests’ plates, this simple showcase encapsulate the season. The bold decision of a one color palette of orange is diversified through different shades and patterns, the napkins tucked beneath ceramic bowls a great touch to bring out the recognizably Fall decor. Personalize the fallen leaf centerpiece by adding any complimentary flowers, like Mums or Celosia. Spruce up your arrangement with a textured vase like the simple white vase pictured. Make sure any vase you choose won’t take away from your centerpiece, but adds dimension or subtle style. When coming up with centerpieces this Thanksgiving season, don’t be deterred and be sure to get inspiration Thanksgiving itself! Be sure to take notes from our guide, and follow Cottages & Bungalows on Facebook to never miss a post! This warm family home becomes the stage for a winter wonderland party inspired by a vintage finds, creative ideas and welcoming spirit.